Native ads are one of the most important areas of investment among digital publishers and social media companies. The ads come in many different forms — a native mobile ad on the Yahoo weather app, for example, is far different from a native ad in the Facebook News Feed. Nonetheless, what this type of advertising has in common is that it looks and feels like the site itself and so doesn’t disrupt a user’s experience the way traditional banner and side bar ads often have. Native ads also perform better than non-native ads and so command higher prices. For this reason, publishers are in a race to deploy as much native ad inventory as possible. The challenge is that native ads run the gamut — from social ads bought programmatically, to sponsorships that require an in-house staff to create. In a new and exclusive report from BI Intelligence, we examine each of the different native ad formats and look at spending trends for each. 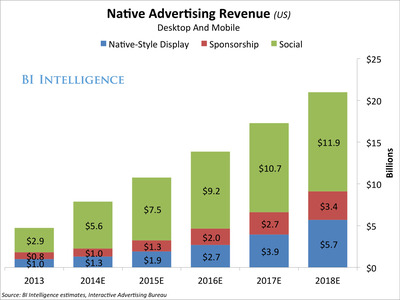 We find that spending on native ads will reach $US7.9 billion this year and grow to $US21 billion in 2018. Social will remain the biggest slice of this spending but native-style display will grow its share rapidly. We are the only research service that has provided a detailed breakdown of spend projections and growth rates for each of the three main native ad types — social-native, native-style display ads, and sponsored content.